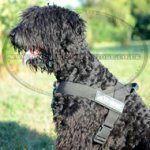 Is a Collar or Harness Better for Dogs? 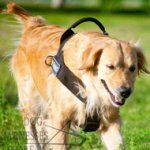 Regarding dog collars their choice is very large: fixing (collars with buckle), halters, correction collars and leashes resembling a horse harness. Your choice of a collar must depend on the dog's character, its strength and level of training. 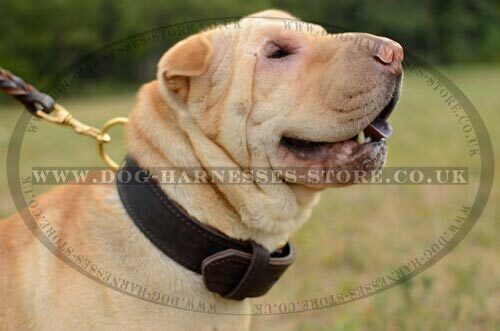 A well-trained dog of any size will feel comfortable wearing a buckle collar - the main thing is that it does not press strongly on the dog's neck by the tension. The collar for all dogs must have a label that contains information about dog's vaccination, permission on its keeping and also all identification data must be present on the tag. This type of collar is usually all you need for small and large dogs training. 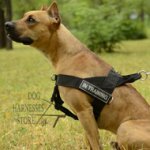 Some trainers advice a halter using for highly energetic or timid dogs that rush forward or show aggression towards other dogs or people. This humane device for training is based on the same mechanism that allows people to manage large horses - the head is controlled and the body follows after it. 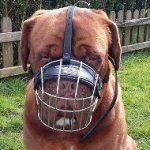 While most dogs behave as if they were stung by a bee, when you first put on it a halter or a muzzle, soon they get used to the new sensation of the nylon strip over the nose and become more manageable. Although halter is not a muzzle, it allows better control of the dog than a usual collar. 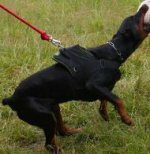 Choke collar is tightened when the dog tears ahead from the owner or if the owner pulls the leash in order to draw dog's attention. 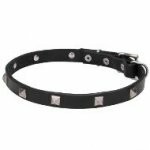 The efficiency of such a collar is determined by the level of tactile sensitivity and pet's vigor. But do not forget to put the collar off when it is no longer needed. Very many dogs suffocate annually when the owners let them play with other dogs or walk near the house with corrective collar. These collars also affect the spinal cord of dogs that can lead to the manifestation of irritability and aggression by some dogs. Keep this in mind! If your dog needs special conditions for training, if there is a risk of tracheal compression or by fits of coughing, it is better to use a harness. 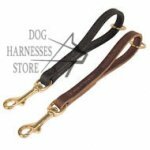 Harnesses are of two types: special and regular. Incorrectly chosen leash and collar can hurt your dog and hinder the process of training. Take the time to find the right accessories for dog training taking into account its specific features and then a walk with a four-legged friend will be the most peaceful moment of your day. 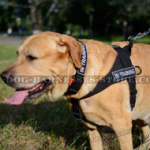 Learn also how to choose harness for your dog.